Are you coming back to knitting, or looking for a present for a friend? One of Bulldog Krafts' knitting kits might be just what you are looking for. 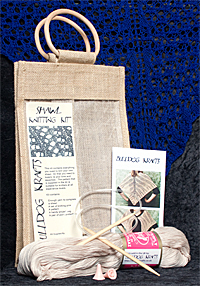 Each kit contains everything needed to produce a completed garment, from the yarn and pattern through to a set of quality bamboo knitting pins. Select a pattern and make a note of the requirements (yarn type and ammount, knitting needle(s)) for the size you need - Click Here. Order the pattern. Select the colour of the yarn for your kit - Click Here. Order the amount of yarn you need. If the pattern requires more than one set of knitting needles, you can order the second set from our knitting pins page. Your shopping cart allows you to check that you have all the parts you need for your kit ordered. When you reach the PayPal check-out you should leave a note telling us which needles you wish to be included with the kit.